Subject: Online Skill Test for ALL SLIET students, which helps you to get jobs and Internships. This is a short online test, which can be scheduled in your computer labs or can be given via mobile phones as well. Note – Candidates who have not cleared technical interview in last 3 months are not eligible to re-appear in the interview process. Also candidates who could not clear Polestar Aptitude Test in last 1 month also cannot re-appear. 2) Should have 60% & above marks in B.Tech / B.E. Torrent Group having worth over Rs. 18000 Cr + ( USD 2.18 billion) is a multifaceted and dynamic organization dedicated to transforming life by serving two of its most critical needs – healthcare and power. Be it Generation or Transmission or Distribution, Torrent Power encompasses entire value chain of power industry. Torrent has recently forayed into City Gas Distribution Business to meet another critical need and has aggressive plans to expand into the states of Gujarat, Rajasthan, UP, Telangana, Tamil Nadu, Maharashtra and Punjab. Torrent believes that inflow of Graduate Engineer Trainees (GETs) into the organization is necessary to infuse fresh thinking as well as to create a leadership pipeline for its existing & upcoming businesses. In pursuance of the same, currently Torrent is looking for bright Engineering Graduates. B. Tech. /B.E. in Electrical/Mech/Instrumentation 1st Class / 60% marks in aggregate of all semesters without any back logs/ATKT. ü Minimum 70% marks obtained in 10th & 12th Standards separately. ü Torrent Power – Agra (UP) and Bhiwandi (Maharashtra). Torrent Gas: Gujarat, Rajasthan, UP, Telangana, Tamil Nadu, Maharashtra and Punjab. We are hiring 2019 Batch B.Tech students and glad to share this exciting opportunity with you. About the company:- Ginger Webs is a leading technology company in assessment and testing industry. We are driven by an ideology to make unique, easy to use and futuristic applications. We are having a decade of experience in assessment industry, the OMR experience leverage the foundation of online assessment and helped us build a platform that can support large volume online assessment with ease. We look forward to your application to take the process ahead. Note â€“ THE ONLINE APPLICATIONS WILL BE ACCEPTED THROUGH FIRSTNAUKRI PLATFORM ONLY. Note: Read carefully and act accordingly under intimation to the office of T&P. This is regarding our nation-wide annual coding competition, Virtual Campus League ’18. Techgig.com – India’s biggest IT community and Guinness world record holder is organizing Virtual Campus League 2018. VCL is an inter-college National level programming/coding event where best programmers and tech-enthusiasts from engineering colleges come together to compete against each other. Through this initiative, 40,000+ students & 500+ campuses will get exposed to 500+ Jobs/Internship opportunities at top IT/Tech firms and exciting prizes. This initiative also aims at preparing students for placements via practice tests which are based on the format of questions that are asked in these top IT/Tech firms. Winner will get the prizes worth Rs. 2,00,000. The contest will run for over a period of 40+ days starting from 3rd Sept to 29th Oct, 2018. Attaching a deck for your perusal. I would request you to please circulate it among the college students and suggest a date on which our team can visit the campus to conduct the contest. Note: Interested students are required to submit their consent on or before 26/09/2018 up to 4 p.m.
We will be hiring candidates for Dot net profile. 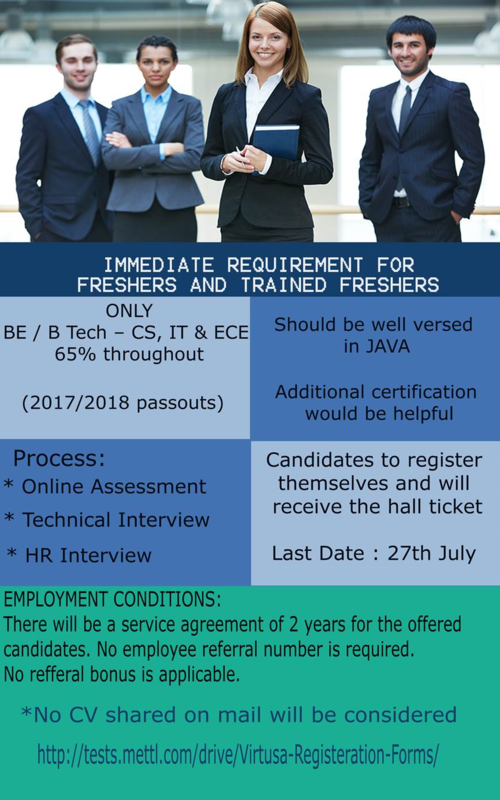 We also request you to arrange some candidates from pass out batch 2018 who are looking for job and interested in Dot Net profile. Candidate who have knowledge in Dot net or PHP or pursuing training for same are also invited. • Solid knowledge of user interface design, usability methodology, information architecture, industry standards and trends, platform and browser capabilities. • The candidate must be able conceptualize and handle teams developing enterprise level web applications. • Needs to have a keen eye for detail, able to understand client perception and adopt ideas to suit a multi-cultural environment. • Well versed with Architecture & Design, Design Patterns, UML, OOPs & OODs concepts. • Must possess database design and programming skills using MS-SQL Server 2005, 2008 and other RDBMS. • Review Technical Design Document prepared. • Evaluation of third party tools and components. • Candidates having experience in MVC will be preferred. Cogniter Technologies is a well established US based web/mobile development and internet marketing company delivering the top quality end to end solutions to its clients worldwide. Being in IT business since year 2004, Cogniter Technologies has a strong team of 100+ experienced IT experts. We have more than 14 years of industry experience in making world class web based applications and mobile apps. We take pride in mentioning that we have developed IT applications for Fortune 500 companies like Abbott Laboratories, American Airlines, Siemens, Hotels.com, The Weather Channel, Aria, Roku, Newscorp and many more. Cogniter has never limited its vision. It has expanded its horizons throughout USA and Canada. Known for quality work, within 14 years of its establishment, Cogniter has become one of the hot favorites for anybody and everybody looking to expand his/her business online. We are ISO 9001:2015 Certified and a Microsoft Gold Partner. You have already participated in the TCS online test on 02 September 2018 and many of you excelled it. We are happy for the same. Here is the one more opportunity for your to grab your dream job. CodeNation is hiring for 2019 & 2020 graduating candidates for Software Development Engineer and Summer Internship respectively. For summer Internship : Stipend of Rs 75,000 per month + benefits. 60% and above in Graduation i.e. average of all semesters till date with No year gap during Graduation and who are not selected for any other company up till now. Shortlisted candidates will undergo training program. Paid Internship of up to maximum 3 months will be offered only to qualified candidates after the training program. Note: The Probationary Training Program is commencing shortly with limited seats in Nov 2018! It is for the information of all Final Year Degree (GME, GWT, GIN, GEE & GCT) Students that Hindustan Unilever Limited (HUL) has taken the interest to recruit our students of 2019 batch through their Executive Trainee (ET) Programme. In this regard all the interested students of final year degree (GME, GWT, GIN, GEE & GCT) are required to submit their consent by visiting the department of Training and Placement on or before 31st August 2018 up to 01:00 PM. CAMPUS PLACEMENT BY ISGEC HEAVY ENGINEERING LTD. It is for the information of all Final Year Diploma & B.Tech. (Welding Technology) Students that a team of ISGEC HEAVY ENGINEERING LTD. is interested in the campus hiring process. In this regard all the interested students of Final Year Diploma & B.Tech. (Welding Technology) are required to submit their consent by visiting the department of Training and Placement on or before 30th August 2018 up to 01:00 PM. We are happy to inform you that, the department of Training and Placement of the institute is regular in touch with below mentioned companies & expecting the campus placement drive in coming month of September/ October 2018. It is desired that all the interested & eligible students of UG level, who are willing for placement are required to register themselves by visiting the department of Training and Placement on or before 05th September 2018. Students are required to visit the website of respective industries accordingly update & prepare themselves. All the concerned are requested to act accordingly, so that good number of SLIET students may be placed after passing all stages related with their desired, technical/ soft skills. Interested candidates may send their CV to the office of T&P SLIET through email tnpoffice16@gmail.com on or before 27 /08/2018 up to 2 pm. This is refer to our telephonic discussion held today & desired, pl find attached the Job description for the vacancies available. Pls share the profiles of the candidates with the following requirement. Experience: Fresher/ 1-2 yrs Experience. Qualification: MBA/ PGDM (MARKETING) OR B.Tech (food Technology). Nativity: Male Candidates are preferred. The Accenture Innovation Challenge is now LIVE and last extended to 26th August 2018. More details mentioned below. Here’s your chance to showcase your ground-breaking idea on a national platform. We are looking for innovations on ‘Businesses’ and the ‘Society’ that have the power to innovate the future and make an impact on the way we live and work. You can participate as an individual or as a team (with up to four team members). If you win the grand prize, each of you could take home prizes worth INR 1,50,000. What’s more? We have exciting prizes for winners of each theme and other special categories. With TCS Ninja National Qualifier Test is approaching, we are striving to give the Best-in-class preparation to students in all the possible ways. Recently, TCS has released TCS Ninja Official Mock test. But the major missing element in the official mock test is that it is devoid of the answers. To help students in knowing the answers and their detailed solutions, we are hosting a Free webinar as a part of our ‘Wednesdays On-Air’ titled ‘TCS Ninja Official Practice Test questions solving session’ on Today at 8 PM. The solutions to the TCS Official mock questions will be solved in a clear and detailed manner. Students can get cleared of their doubts instantly by joining our live session. Name of the company: EPAM Systems, Hyderabad (www.epam.com). Date: 27th and 28th August 2018 (Monday and Tuesday). Batch: 2019 pass out ONLY. Eligibility: Minimum 65% and above aggregate from 10th onwards. No active backlog’s. Job Location: Hyderabad / Pune / Bengaluru. Date of Joining: Jul’2019, Oct’2019. 1. Coding knowledge in Java. 2. Good at writing Algorithms. 3. Good in Data Structures and OOPs concept. 1. Prior experience in participating in any kind of coding contests. Round 4: Behavioral assessment / HR interview ~30 min. On 28th August 2018 (Tuesday): Spillover Technical face to face Interview and Behavioral assessment/ HR interviews. Subject: We are in touch with below mentioned industries all the interested students are required to send their consent and CV to the office of T& P on or before 21 /08/2018 up to 4 pm through their respective FPC & PR’R-19 batches or directly to the office of T&P through email. We are happy to inform you that, we have successfully conducted “Recruiters Connect at Quark City Mohali”. As an output of the meeting, the department of Training and Placement of the institute is regular in touch with below mentioned companies & expecting the on-campus placement drive in coming month of September/ October 2018. 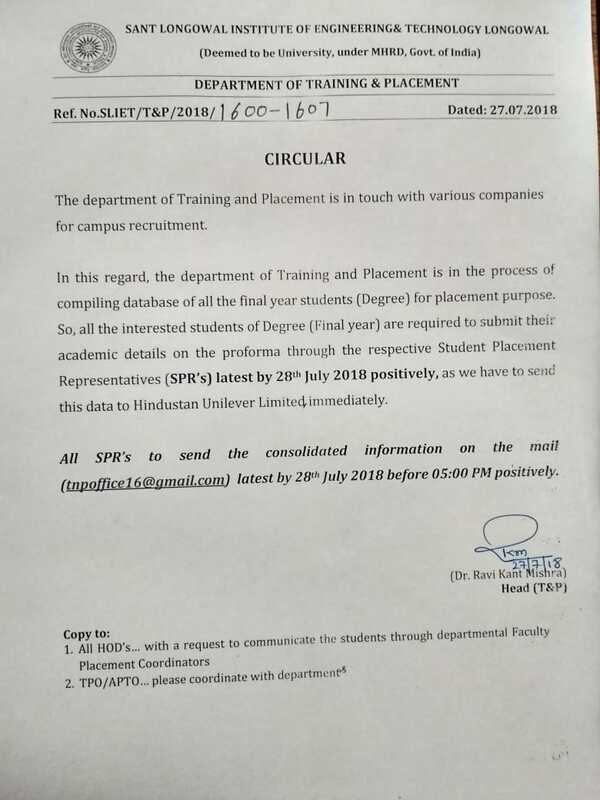 It is desired that all the interested & eligible students of UG/PG level, who are willing for placement are required to register themselves by visiting the department of Training and Placement on or before 30th August 2018. Interested students must submit their CV and consent in department of T&P SLIET on or before 07 August up to 5 Pm. Applications open- 2018 and earlier batches. We are open to evaluating 2019 batch provided they are available for joining/ internship. Note : *All rounds are elimination rounds. All the eligible & unplaced students are required to register themselves on the link given below. Last Date to Registration: 27th July 2018 before 1:00 pm. Join me to congratulate our CSE Students for getting Job Offer by COGNIZANT TECHNOLOGY SOLUTIONS INDIA PVT. LTD.
Congratulations for the new job! Finally, you will be spending your energies on tasks you are really passionate about. Greetings from MyAnatomy Integration Pvt. Ltd. ! EPAM Online Test Extended Till 19 July ,Kindly inform your studentsto grab the opportunity before the last date. EPAM is looking for engineering students to build its Pune & Hyderabad delivery centers. We feel privileged to invite you to encourage your students to participate in this placement drive and explore the vast opportunity available for them to secure a strong foundation for their career. We feel privileged to partner with We are as Online Assessment Partner and glad to recommend your Institution for the proposed drive of EPAM India as per the details mentioned below. Hereby, we recommend you to advise your students to apply online as per the registration link mentioned below. Please note that we do not play any role in the gamut of selection process. MyAnatomy support team will be happy to assist you for any further glitch during the test. The test link will be Active Till 19th July 9 .00 pm. We would like to once again clarify that MyAnatomy does not involve in any financial benefits or compliments from the Colleges/Students participants in any manner for this reference/ recommendations, before or after the Event/Selection. Greetings from AutoSol Team Germany !! 100% training part is funded for selected participants. We are happy to reach you with incredible chance for engineering students (preferably first and second year students) to experience the world largest Automotive trade fair Automechanica Germany 2018 along with our unique technology exchange program. The main value additions are: Along with Automechanika 2018, students get chance to have hands-on-training on German technology organised by worlds renowned companies like BMW, Mercedes, Volkswagen, etc. More than 40 top german companies are joining in this training activity and minimum 4 courses and certificate avail by individual student. And also there is an opportunity to visit AUDI and Opel car manufacturing plants. Interested students can already apply at http://www.indoeurosync.com/summer-school-registration.html. Very happy to invite students from your organisation to be a part our technological activity in Germany. Batch-Batch 2017 / 2018 pass out. Min. 60% and above in Current Degree. No eligibility for 10th, 12th and Graduation (in case of MCA / M. Tech / M.Sc.). ·Trainees will get a stipend of INR 16,000/- during training period of 12 months. · Company will provide free pick-up & drop in Delhi-NCR. In case of regularization post successful completion of 12 months training the starting salary package will be INR 3.30 lakhs per annum with the designation of Associate Network Engineer. NOTE: Eligible and interested student’s from your respective University / Institute are expected to be in formal attire & must carry a hard copy of their updated resume along with two passport size photographs, ID proof, DMCs / Certificates from 10th onwards (both original and photocopies) along with them. Join me to congratulate our below mentioned students for getting final selection as Associate III – Mobile Plant Samsung India. Nothing is impossible when you put your mind and heart to it. Congratulations on your new job! a. Each day is broken up into a 9 hrs – to give the employee greater benefit of flexibility. b. Only 90 hours or 10 days PTO are carried forward to the next calendar year. c. There is no encashment of PTO at the end of the year. d. 6 Indian Gazette Holidays (falling over the weekdays) are given over and above Paid Time Offs. e. For the Night Shifts(East & West Coast) you will have 8 US holidays that will be forced Paid Time Offs, and will get adjusted from the 26 days Paid Time Offs you receive. f. Australia & International – there may be some country specific holidays you may be requested to follow depending on the territory you manage, these will be considered forced PTOs as well. Speech shadowing is an experimental technique in which subjects repeat speech immediately after hearing it (usually through earphones). It has been used in research upon speech perception and stuttering. Experimental applications. The speech shadowing technique is used in dichotic listening tests. As discussed, UST Global is recruiting based on scores achieved in PRE-ASSESS® for the 2018 Batch students. Please see the details below. Kindly pass this information to the eligible students from your end, this will ensure awareness among the students. As the students from your institution have not enrolled in our program, we would like to extend this opportunity to them as well as a token of appreciation. For this, we would require the database of the students in the attached format so that the students can take the assessments from home and further shortlisted candidates can take part in the drive as well. Candidates will be given logins and details to take a take from home test. Shortlisted Candidates are required to travel to the Company Office for further rounds. As discussed, With reference to the campus hiring process for the Graduate Apprentice Program (GA) at Bosch Ltd., we are pleased to share with you the Job Description of the program (as attached). Aspiring Minds is working with Bosch as their preferred assessment partner. please share the list of eligible candidates. Students shortlisted from the online test would undergo a further interview process at Bosch Corporate Office in Jaipur. Further details would follow soon. Please feel free to connect with me incase you need further assistance. Hope you are doing well. ConsenSys, the largest blockchain technology firm in the world, is hosting India’s biggest Ethereum Blockchain Hackathon at IIT Delhi fromJuly 13-15, 2018. We are flying down our top developers to mentor the Hackathon participants andJoseph Lubin, our founder, will personally be judging the final projects. Given your institution’s expertise in the fields of engineering and Computer Science we thought you would want to share this wonderful opportunity with your student body. The mail below contains all the relevant information for the Hackathon, including a link to the application form and is ready to circulate in its current form. Top teams will receive a cash prize and stand to receive a job offer from ConsenSys. Team Size: 2-4 individuals.Teamscannothave more than four members. Shortlisted teams will receive an email communicating the Hackathon rules, regulations and a detailed agenda on 6th July 2018. We knew you would make it! Congratulations on a new chapter in your life. Ever since your entry in SLIET, We always knew you would become successful in life after getting opportunities. We have seen you go through a lot of changes, and now we feel you have matured a lot. We have seen you people to conquer on various occasions in SLIET, and earn your well-deserved degree. And now, I am so proud of you for becoming a full-pledged professional. and training is the essence of transformation. Our Company is organizing a mobilization drive named “e-3C” both for the appearing and pre-final year engineering graduates and technicians to provide them a platform for a productive career. Campus should participate in this drive, so that Candidates can avail the benefits of the drive to opt for the better career opportunities in near future..The on-line training(Virtual mode) is also available for the candidates who want to opt for this Apprenticeship program(internship). “e-3C” in itself is an innovative initiative taken by RAPS iTech towards the development and growth of an individual in the IT sector. “e-3C” (Company – Campus – Candidate) powered by RAPS iTech. Apprenticeship: We are authorized by Govt. of India under MHRD to give stipend based apprenticeship to B.E/ B.Tech & Diploma students acquiring special IT software skills. Employment: After the successful completion of Apprenticeship, candidates with high score and best performance will be absorbed by the company itself and rest of the apprentices will be interviewed by Top MNC companies within our other placement program. Our objective is employability enhancement bridging the gap between Academia and industry. As per office circular no. SLIET/Dean(A)/2018/286-90 dated 16.05.2018 from Dean (Academics), all the above concerned students are required to submit the following documents along with industrial training dairy. 1) The Employer Survey Form (Duly filled and signed by the concerned Employer) after completion of their industrial training. The students can download the Employer Survey Form from the Institute’s Website i.e. www.tnp.sliet.ac.in and click on “Employer Survey Form”. 2) The students may also have required to maintain their industrial training diary. The students can download the Industrial Training Diary as well as Instructions & Guidelines from the Institute’s Website i.e. www.tnp.sliet.ac.in and click on “Industrial Training Dairy. (https://www.facebook.com/UnileverDiariesIndia/) from 4:45 PM. Students need to login using their individual FB IDs & in the Comments section of the LIVE video they need to write their <Name>_<Institute Name>. * Only individual user views will be considered. T&C to be shared by HUL Campus team. Requesting you to share the flyer below & details with all the students in your institute. For more details, feel free to reach out to Devika Kaushal, Kavitha Raman & Abhirupa Biswas. Looking forward to an overwhelming response.